Nominations for the 2019 Alumni Awards are being taken! The deadline to nominate is May 1, 2019. Any nomination received after May 1 will go towards 2020 nominations. 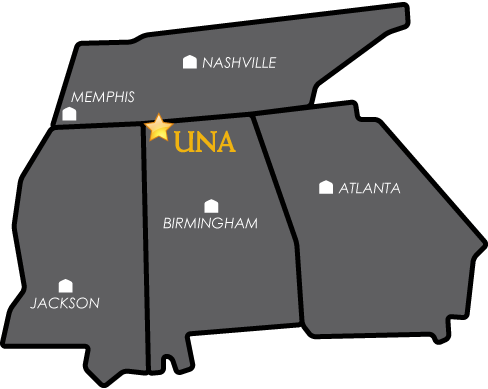 In establishing these awards, the UNA Alumni Association seeks (1) to recognize alumni and future alumni who, through their service, have brought great distinction to themselves and to the University and (2) to foster continued interest in and support of the University. Each year, members of the Constituency, Executive Committee, and Board of Directors actively will seek nominees for these awards. Nominees will be presented to the UNA Alumni Association Awards Committee for final selection. The Board will determine the number of awards to be given in each category each year. Presentations for the following Alumni of the Year Awards and Alumni Service Awards are made at the annual Homecoming banquet. The Fan Club presentation is made one game each season in four sports: football, basketball, baseball, and volleyball. This award will be given each year to alumni of the University who have utilized their degrees earned at the University and made great inroads and successes in their subsequent professions. Community Service: This award will be given each year to an alumnus (or alumna) of the University who has contributed greatly to the advancement of his/her community (local, region, or national) or to the University or to both through volunteer efforts or philanthropic endeavors. Political Service: This award will be given each year to an alumnus (or alumna) of the University who has contributed greatly to society within the realm of local, state, or national governance. The recipient may be an elected official, but selection is not limited therein. Selection will be based on performance and not on political affiliation. Military Service: This award will be given each year to alumni of the University who serve our country. The UNA ROTC Lion Battalion remains visible and has a proud tradition of providing quality officers from North Alabama. In addition to the UNA ROTC graduates who become future leaders of the U.S. Army, alumni who serve the armed forces in the Navy, Marine Corp, Air Force, Coast Guard and exploration of Space are considered for recipients. Faculty/Staff Alumni Service: This award will be given each year to an alumnus (or alumna) of the University who is a UNA employee and has contributed greatly to the advancement of his/her community (local, region, or national) and to the University or to both through volunteer efforts or philanthropic endeavors. Educator of the Year: This award will be given each year to an alumnus (or alumna) that has excelled in a profession as educator at the elementary, secondary or college level either as a teacher or administrator. They have excelled in that profession and received accolades and awards from their peers. Friend of the University: This award will be given each year to a member of the University family who is not a graduate of this university but has given time, talent, and resources for the benefit of the University. Lifetime Achievement: The Lifetime Achievement Award recognizes an alumni of the University for a lifetime of accomplishments in career and/or community service. Promising Alumni: This award will be given each year to graduating seniors (eight) who have demonstrated great promise in their chosen fields (through academic performance) and who show great potential for future community and university service (through co-curricular involvement). They are nominated and voted on by the faculty and staff of the University.